Bill Dyck, New Zealand Tree Grower November 2014. With over 1,000 pests and pathogens worldwide which can attack radiata pine, and thousands more that can affect other New Zealand plantation species, it is critical that the forestry sector has a strong focus on biosecurity. The forest biosecurity committee is in place for that purpose. The committee is managed as described on the bottom of the page. It uses and makes recommendations on levy funding for the protection of the industry’s forests and trade. The committee may also be involved in non-levy funded activity. 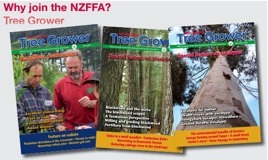 Where levy funding is involved the Forest Owners Association and NZFFA boards provide a comprehensive report on all activities, committees and otherwise, through to the levy secretariat and to the Forest Growers Levy Trust board. Liaising with the dothistroma control committee and the stakeholders for methyl bromide reduction on biosecurity problems associated with the log trade. The annual budget for the committee is approximately $860,000 all of which is from the forest growers levy. Most of the money goes to conducting the annual forest health survey and associated diagnostics carried out by Scion. An annual sum of $65,000 has been allocated over the next two years to redesign the forest health surveillance system, including the survey and reviewing diagnostic and database capability. The total value of the redesign project is about $300,000 and funding is also being obtained from the Ministry for Primary Industries and Scion. The forest biosecurity committee is also funding efforts to enable the forestry sector to sign up to the Government Industry Agreement with the Ministry for Primary Industries and this is discussed later in this article. Costs are mainly associated with attending meetings and workshops, but may also involve specific investigations into the costs of previous incursions in order to make a stronger case for forestry. New Zealand plantation forestry has had a biosecurity surveillance scheme of some form or other in place for over 60 years. This reflects early concern about another Sirex wood wasp or dothistroma-type needle blight becoming established, creating significant damage and leading to financial losses. More recently there has been increasing concern about the potential damage of new insect and pathogen incursions, especially to the log trade, as there are many pests and pathogens on the lists of unwanted organisms of trading partners. The forest health surveillance scheme has two main objectives. The first is to detect new incursions early enough so the pests can be eradicated and not significantly affect the health and vigour of the forests. The second is to protect trade in forest products, mainly by providing assurances to trading partners that we know what might be on our logs and timber, so they do not need to worry. Initially run by the government, the scheme was taken over and modified by the Forest Owners Association in the late 1980s. Peter Carter developed what became known as the Carter model, which was used to base surveillance intensity on risk derived from pest detection data available at the time. There have been several reviews and modifications to the scheme since then and the current system involves aerial survey, drive-through survey, forest health inspection plots and back-up diagnostics, mainly by Scion. As a result of the introduction of the log levy, the need to expand to provide coverage to all New Zealand plantation forests and also to improve the scientific basis of the forest health surveillance scheme, it is currently going through a redesign phase. Scion, AgResearch, the Ministry for Primary Industries, SPS Biosecurity and the Centre for Biosecurity Risk Analysis located at the University of Melbourne are helping the Forest Owners Association to develop a new system. This will provide greater assurance to both forest owners and trading partners that new incursions can be rapidly detected. Development and full implementation of the scheme will take until July 2016. However, in the meantime the existing system will be used and improved as new knowledge and design information becomes available. 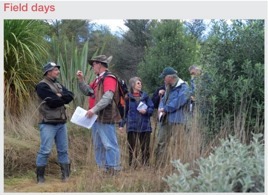 The Centre of Excellence for Biosecurity Risk Analysis will be contributing to the project by analysing climatic models and knowledge about specific pests to determine their risk profiles for New Zealand forestry. The project brings together Australian and New Zealand expertise, existing data, and produces a new forest health surveillance scheme which will allocate scarce resources to ensure rapid detection of new incursions. It will also provide greater confidence to trading partners that our forests and exports are free of unwanted organisms. An important component of the forest health surveillance scheme is diagnostic capability. Significant improvements in diagnostic technology have been made in recent years, particularly molecular technology which can provide much more rapid and definitive identification of new organisms. However, this advanced technology runs the risk of becoming a two-edged sword. It is possible to get too far in front of trading partners and identify unwanted organisms present in New Zealand forests which may also be present in other countries, but are not identified because they have not yet been discovered and analysed there. Biosecurity research is an important supporting component for a strong forest health surveillance scheme. The research also helps industry and the Ministry for Primary Industries to make the correct decisions when new organisms are discovered. The Ministry is required to inform trading partners when an organism is discovered in New Zealand which may present a phyto-sanitary risk to them. Often research is required to determine if an organism can be found on an export pathway, whether it would probably establish in another country, and the probability versus the possibility of establishment. Scion recently published the results of some very detailed research on the likelihood of Phytophthora pluvialis, the cause of red needle cast, and P. kernoviae being exported on logs to overseas ports. The research showed that logs are free of these organisms and do not present a viable way of spreading the pathogens, either within this country or to overseas markets, at least under New Zealand conditions. A major initiative in which the forest biosecurity committee is involved, and which has been underway for about nine years, is the Government Industry Agreement process.The Government Industry Agreement Deed was approved in December 2013, allowing the process to advance to the stage where industry can now sign up. The agreement is about a partnership between government, in the form of the Ministry for Primary Industries, and primary industry to improve post-border biosecurity. The two main components to the agreement are readiness and response. Readiness is being prepared for incursions, mainly by developing and implementing surveillance systems to detect and identify unwanted organisms before they can establish and spread. PSA in the kiwifruit industry is a good example of where having a surveillance system in advance could have saved the industry many millions of dollars and grief. For response, under the agreement the Ministry and the industry sectors are jointly involved in decision-making, unlike pre-agreement days where the Ministry made all the decisions. But it is also about cost-sharing. Where possible, cost-sharing arrangements are worked out in advance of an incursion by the development of operational agreements. For some sectors, particularly the animal sectors, this is relatively straightforward as there are only a few main unwanted organisms of concern and operational agreements can be readily developed to deal with these. However, for plant-based sectors such as forestry, there may be a large number of unwanted organisms of concern, many not even yet identified to science. The Forest Owners Association with its NZFFA partner, is currently preparing a case to the Ministry for Primary Industries to sign the Government Industry Agreement Deed. At the time of writing,the case is to represent all commercial plantation forestry interests. The qualification is that when a response is required the level of effort, including money and other resources, would be relative to the value of the tree species being affected, or likely to be, by the incursion. This obviously means that the sector is willing to invest more to combat an incursion to radiata pine or another significant plantation species than it is to deal with one which may affect a minor species. It is critical that the sector continues to evolve its ability to identify new organisms and to develop solutions to new problems as they occur, or preferably even before. Breeding for disease resistance is a long-term uncertain proposition. New technology is required to provide greater assurance that radiata pine and other important plantation species can stand up to attacks by new pests and diseases which may slip through the border and surveillance system and become established. The new forest health surveillance system supported by science and statistical modelling, together with the new formal partnership with government, should improve the forestry sector’s ability to rapidly detect and respond to new pest and pathogen incursions before they can establish and cause significant damage. However, no system is infallible. It is imperative that those involved in the sector who are familiar with trees on a regular basis are vigilant and report suspicious symptoms of poor tree health, unusual insects or diseases as soon as they are discovered. Early detection and diagnosis is vital to eradication. Bill Dyck provides administration support to the forest biosecurity committee and is contracted to the NZFOA as Manager of Biosecurity.